Wash the spinach then blanch for 30 seconds in boiling water. Cool in ice water. Drain well. Blitz the spinach with salt and a generous splash of extra virgin olive oil. Roast the pine nuts in the oven then cool. Blanch the cavolo nero in boiling water then cool in ice water. Drain well. Finely chop the cavolo nero. Season with extra virgin olive oil, salt, pepper, garlic and pine nuts. In a large pan, bring the olive oil to medium heat. Sauté the shallots, leeks and celery until soft, stirring as needed. Add the garlic and thyme leaves, stirring for a further minute or so until the garlic softens and become aromatic, however do not let the garlic take any colour. Add the rice to the pan and give it a quick stir to ensure it is lightly coated with the oil/pan juices and that it is not catching to the base of the pan. Continue to cook until it starts to make a slight popping sound. Add the wine to the rice. For approximately 2min, continuously stir to allow for reduction and to ensure it does not stick to the base. (During this time the alcohol dissipates, and the wine will change character). Slowly add the stock ladle by ladle, only adding the next ladle after the previous one has been absorbed. This should take approx 15mins. During this time, you will notice the risotto starting to come together forming a lovely creamy consistency. When cooked, add the chopped garlic shoots, butter, spinach puree and grated Parmigiano Reggiano. Continue stirring to emulsify. The final consistency can be adjusted by adding a small quantity of additional stock or a little more cheese if needed. 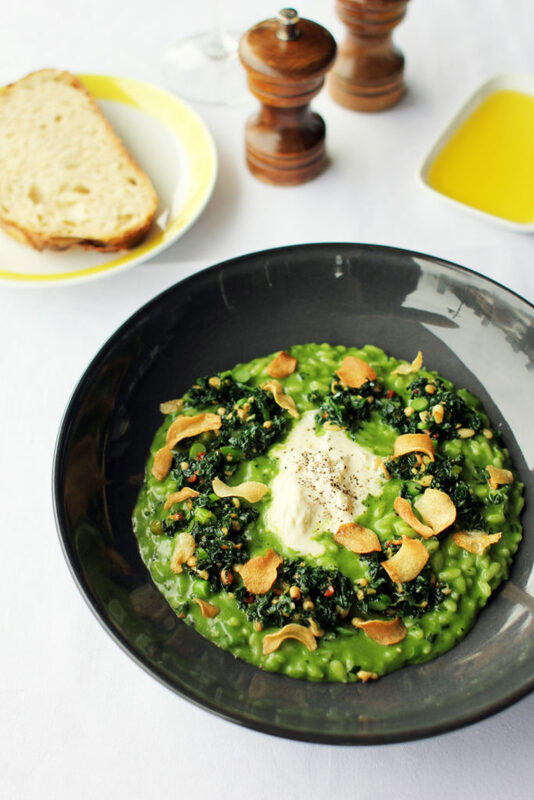 Plate a serving portion of the risotto, then the cavolo nero pesto and stracciatella cheese.